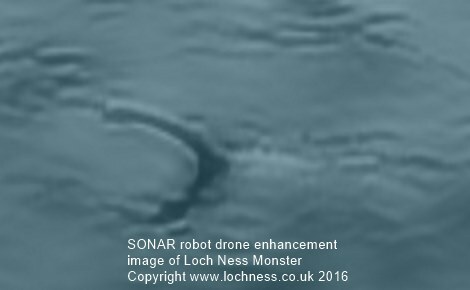 Automated SONAR Robot Drone Droid unveils Loch Ness Monster in Loch Ness? EXCLUSIVE! Finally, the Loch Ness Monster SONAR image to silence all the sceptics and Nessie nay-sayers. World famous Loch Ness Monster (Nessie) researcher and local commentator, Mikko Takala, worked with an advanced Robot Drone SONAR technology firm to create this clear image of Nessie - a plesiosaur - in Loch Ness. The incredible image provides the strongest evidence for a plesiosaur Loch Ness Monster. Mikko says, 'I'm delighted by this SONAR Loch Ness project and investigation using the latest high technology. It's a first for Nessie on the Net and the results are positive. There clearly is a monster in Loch Ness. I think there can be no doubt to that anymore'"